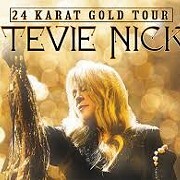 Billed as a night of storytelling, Stevie Nicks' 24 Karat Gold Tour that rolled into the Covelli Centre in Youngstown last night featured no shortage of behind-the-scenes glimpses into her life — musical and otherwise — in between a well-sequenced, fan-friendly setlist. Nicks and her band walked onstage to the strains of Missing Persons' "Destination Unknown" and launched into a pair of sunny and laid-back numbers, "Gold and Braid" and "If Anyone Falls." The tunes felt like a warm-up of sorts, a way for everyone to ease into the show, although the latter boasted especially fantastic harmonies between Nicks and her backing vocalists, Sharon Celani and Marilyn Martin. 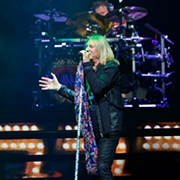 The show picked up considerably—and stayed at a high level—during song three, a smoking version of "Stop Draggin' My Heart Around" that found Nicks' long-time solo collaborator Waddy Wachtel unleashing some smoldering guitar riffs. In fact, her entire band was well-rehearsed and contributed able backing, no matter what the style: loose uptempo rockers (the Motown-esque stomp "Starshine," "Enchanted"), stripped-down, witchy folk-rock ("New Orleans") and '80s rock glitz ("Edge of Seventeen"). Other set highlights included an easygoing "Crying In the Night" from the fabled cult 1973 Buckingham Nicks record—Nicks noted that she was "afraid to do" the song, all these years but that Wachtel encouraged her perform it on the tour—and rare airings of the poetic early '80s solo cuts "Wild Heart" and "Bella Donna." Perhaps the night's standout was the piano-surged ballad "Moonlight (A Vampire's Dream)," which she called one of her "favorite songs I've written lately." The dramatic performance found Nicks draping a white fur-like coat over her all-black ensemble and giving an emotional, moving and dynamic vocal performance. 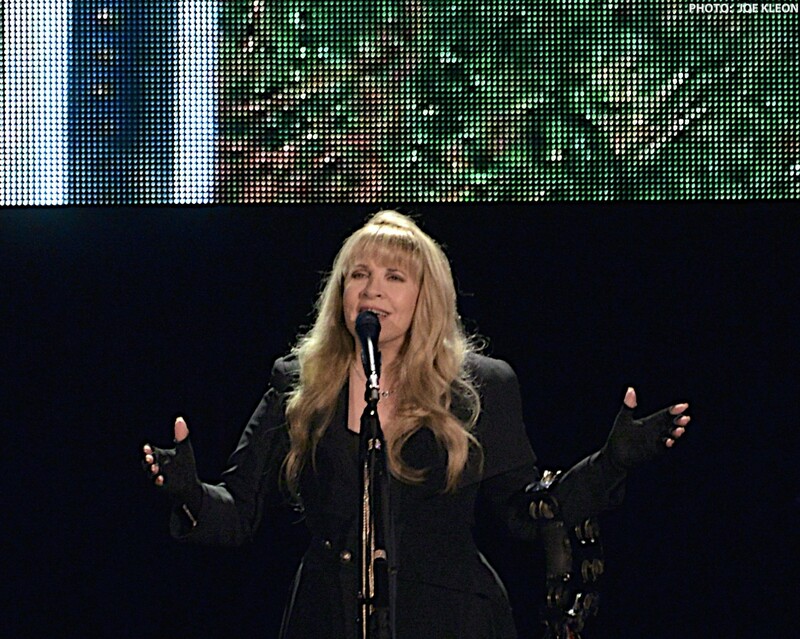 The night also featured select Fleetwood Mac numbers, including "Rhiannon," "Landslide" and "Gypsy," although the standout was a brooding and thundering "Gold Dust Woman." More psychedelic and ominous than it is with Fleetwood Mac, the song found Nicks shaking her entire body onstage—and, thanks to some nifty camera effects on the video screen, making it look like she was possessed and in the middle of an exorcism. Nicks was in fine spirits during her storytelling interludes. 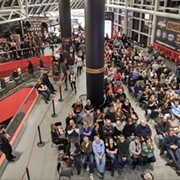 Although the placement and framework of the topics she covered were similar to those on other nights of the tour, her comments were freewheeling, off-the-cuff and often very funny. Her stories felt casual, like she was hanging in your living room having a conversation, and came with animated gestures and asides. As the night wore on, some in the crowd grew tired of the talking—one man could be heard yelling "Play a song!" repeatedly during a later story—but the insights into some of her best-known songs (and lesser gems) were generally charming. She let slip that at the Honky Chateau where Fleetwood Mac recorded Mirage there was no ice and said there's a reference to a Buick Skylark in "Rhiannon." ("Even Lindsey doesn't know that!" she noted.) During a lengthy remembrance of how her first solo album, Bella Donna, came together—a period that included her starting to date the record's producer, Jimmy Iovine—she recalled wanting to make a record in the vein of her favorite band, Tom Petty & the Heartbreakers. When told she couldn't, she nevertheless persisted: "So I can make a Tom Petty girl album?" The Petty thread continued, as she recalled hiding in Iovine's basement while the musician came over and played demos of a new album. (Nicks felt like a "secret reporter" listening in.) More amusingly, she recalls being annoyed after Iovine had some feedback on the record. Nicks feigned the sighing irritation she felt—"What? "—and quipped, "This is how all of my relationships went." Later in the show, after "Stand Back," she mused about meeting and becoming friends with Prince, and how she wrote the song upon hearing "Little Red Corvette" on the radio. (This happened on her honeymoon, no less, and Nicks made her then-husband get off the highway and go to a store to get a boom box to capture the inspiration.) To make sure Prince was okay with his song used as foundational material, Nicks invited him to Sunset Sound, where they recorded "Stand Back," to take a listen. He showed up wearing purple velvet ("Outdressed all the girls in the room," Nicks noted) and not only gave his blessing, but agreed to play on the song. In a sweet nod, she concluded the story by noting that she and Prince became friends who "talked on the phone a lot. …Prince worried about me" because of her drug use and hard living. But there was a pronounced thread to all of these comments, wherein Nicks encouraged people to go after their dreams and be persistent despite loneliness, heartbreak or discouraging comments. That sentiment resonated just as much as the self-proclaimed "gothic trunk of forgotten rock 'n' roll songs" Nicks proclaimed she was playing. Vanessa Carlton opened the night with a 30-minute solo piano set that resonated deeply despite a dull roar of chatter from the crowd. After opening with her hit "A Thousand Miles," she stuck mainly to recent-vintage solo. The arena stage and atmosphere suited the soaring delicacy of songs such as "Carousel," the classical-inspired "Willows," and the weighty "Blue Pool" and didn't obscure Carlton's attention to detail on "The Marching Line," a song for which she recorded vocal loops. Like Nicks, Carlton was also conversational. She explained the significance of the painting under which she was performing—it's meant to honor her grandfather and the role he had in her creative process—and spoke casually with the crowd. "This is my last show with Stevie, so I'm having a glass of wine," she said, before adding that she actually has wine every night, but that it was a "mom's night out" for her, a comment which drew massive cheers. She drew similar applause after giving props to her husband, Deer Tick's John McCauley, for watching their baby so she could do this mini-tour. Cue "I Don't Want To Be a Bride," which seemed to feature looped harmonies from Nicks piped into the mix.